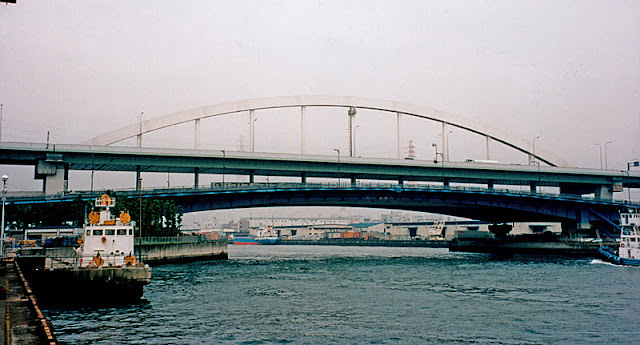 The Nanko Suiro Bridge crosses the Nanko Channel and carries the Wangan Expressway between Sakishima Island and the Nanko Ferry Terminal in Osaka, Japan. This bridge is a little different. Its a single span, single-rib, double deck Lohse arch. The arch is supported on a pair of steel, two-column bents (and on steel pipe pile foundations). You can see the structural steel hangers supporting the two decks. The top deck is on steel box girders with floor beams (or diaphragms) at the hangers. The bottom deck is on steel I-girders and the floor beams are clearly visible supporting the cantilevered deck. This bridge is 163 m (535 ft) long and 29.5 m (97 ft) wide. It was built in 1980 for the Hanshin Expressway Public Corporation at a cost of 3.6 billion yen (about 36 million U.S. dollars). I had written that multi-column bents are uncommon in Japan. However, they are used for wide bridges but usually with two arch ribs. Also, it looks like the lower deck has a shorter span with additional piers at the edges of the channel. My understanding is that a Lohse Arch is a bow-string arch where the arch and tie elements can carry some of the load in bending. I would assume that the tie is part of the box girder system in the upper deck. Any additional thoughts or information about this unusual bridge would be appreciated. 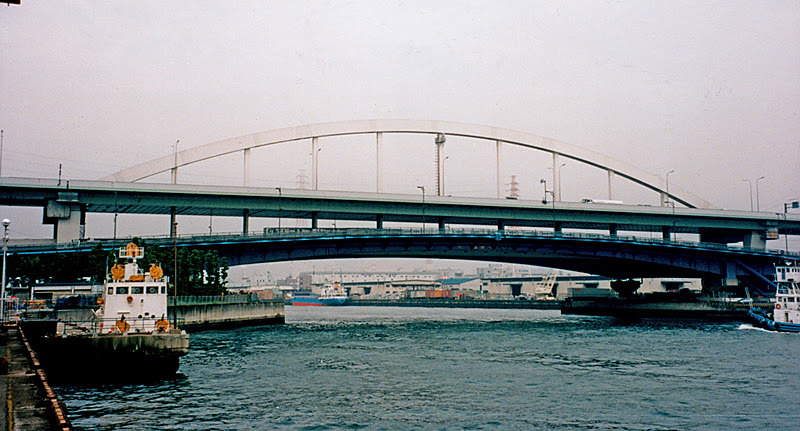 Osaka Bay Bridges: Nanko Suiro Bridge by Mark Yashinsky is licensed under a Creative Commons Attribution-NonCommercial-ShareAlike 3.0 United States License.